D&D Let's Roll Library and Giveaway! Spending the last month writing and chatting with all of you about Dungeons & Dragons has been incredible. We covered every manual and campaign guide along with miniatures, board games and more to provide a comprehensive look at the hobby and the tools you need to enhance your play experience! To celebrate all the content we created, we've collected it into one easily navigated library so that you can bookmark this page and keep our advice on hand whenever you need it. Exploring the world of D&D through Board Games, Twitch Streams, and the Starter Set! Where Can I Watch D&D? Ready to roll up a character or hop behind the DM screen? Let's roll! The Dungeon Master's Starter Kit and Dice Galore! Diving into the colorful world of miniatures and painting! Enhance your game ambience, table presence, and gameplay experience! Active Player Network has partnered with GTS Distribution to offer one lucky Grand Prize winner the entire library of Dungeons & Dragons 5th Edition campaign books including the forthcoming Waterdeep Adventures; Dragon Heist and Dungeon of the Mad Mage. Additionally, five runners-up will receive will receive a prize package of one already published campaign book of their choice between: Storm King’s Thunder, Hoard of the Dragon Queen, Rise of Tiamat, Curse of Strahd, Princes of the Apocalypse, Out of the Abyss, Tomb of Annihilation, or Tales from the Yawning Portal. Distribution of runner up prizes to be determined by the Sponsors. You must like APN on Facebook and interact with the posts we will be initiating over the course of the month. The number of entries per person made during the period of the D&D Let’s Roll event (running July 30-August 24, 2018) will be equal to the number of likes, public shares, and comments/photos/social contributions made on our Facebook Page in response to the community questions, images, and blog posts we share surrounding Dungeons & Dragons. Comments, images, or videos that contain lewd, crass, or inappropriate content are not permitted and do not constitute entries. Entries must be relevant to the Dungeons & Dragons Roleplaying Game. How do I know if I won? Winners will be notified by Facebook message on August 27, 2018. It is our last week of Let's Roll and we are going to open the door to Advanced Adventuring! These products all represent ways to enhance ambience, table presence, and gameplay experience. 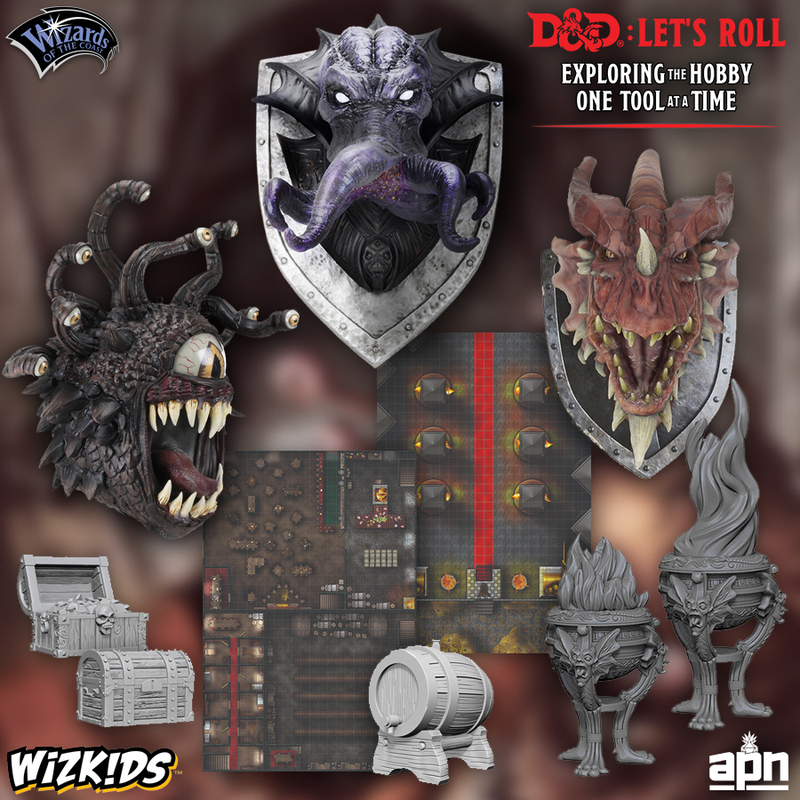 It cannot be stressed enough how much WizKids can partner you in play when it comes to D&D. The first time I saw their trophy heads of beholders, dragons, and mindflayers - I knew I needed AT LEAST one for my game room. These items are the perfect gift for the DM in your life and they the perfect storm for the senses. Show us pics of your best D&D Set up! What are your must have items?